Attractions: Fun connector or loop. 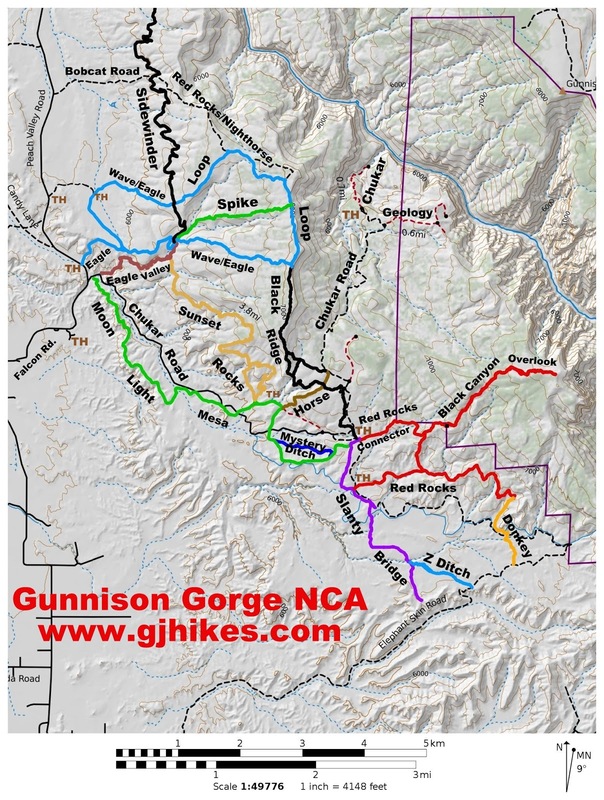 The Black Ridge Connector is located in the Gunnison Gorge National Conservation Area near Delta, Colorado. 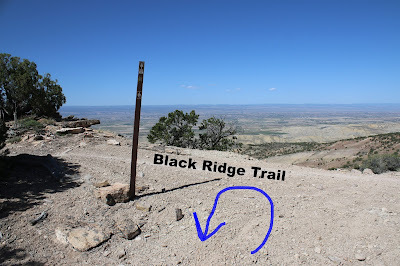 The trail begins off of the Chukar Road and connects to the Black Ridge trail in 2 different places. One spot is higher up on Black Ridge about midway to the top and the other is in a wash near the base of the ridge. Both routes can be used to create a loop or as spurs to connect Black Ridge to the Chukar Road. To get to where this post begins follow the Chukar Road as though heading to the Chukar trail. The pulloff is on the left about 1 mile after passing the intersection of the Elephant Skin and Chukar roads. The Horse trail begins near the same point. 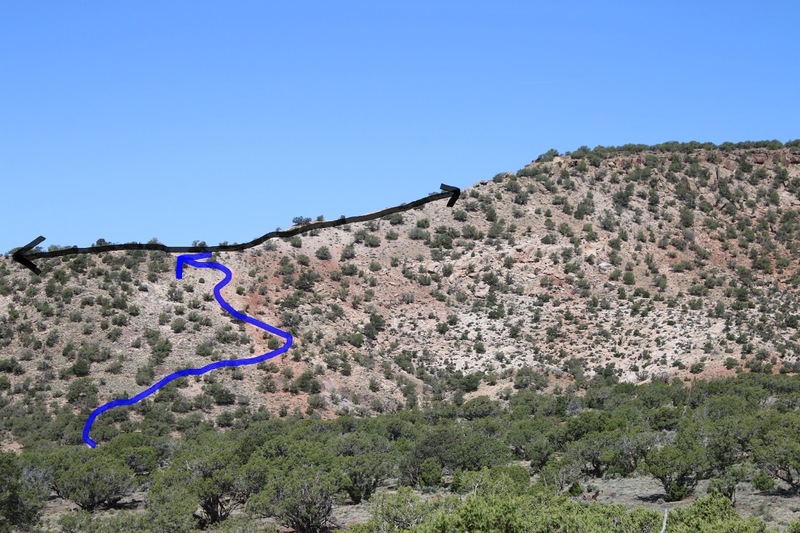 From the Chukar Road the trail takes off through the pinon and juniper trees in the direction of Black Ridge. After a short distance the branch of the trail that climbs up to the ridge comes into view. The trail comes to a wash at the base of the hill, before it begins climbing, where it splits into two separate routes. The left branch follows the wash to the Black Ridge trail and the right branch climbs the mountain. For this post we climbed up to the ridge and on the return trip checked out the wash route. Parts of the trail climbing up to the ridge aren't too bad but there are places where it gets very rocky. The final assault on the ridge is both steep and rocky. For this post we turned around when we got to the ridge after enjoying some nice views gazing out over the valley toward the Uncompahgre Plateau and the San Juan Mountains. Looking back down the trail it's easy to see which direction would be funnest on a mountain bike. We were hiking so it wasn't any big deal in either direction. 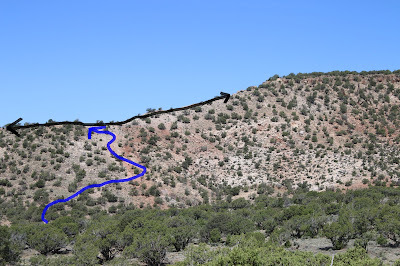 The route that follows the wash stays mostly level with no big ledges and only a little slickrock. 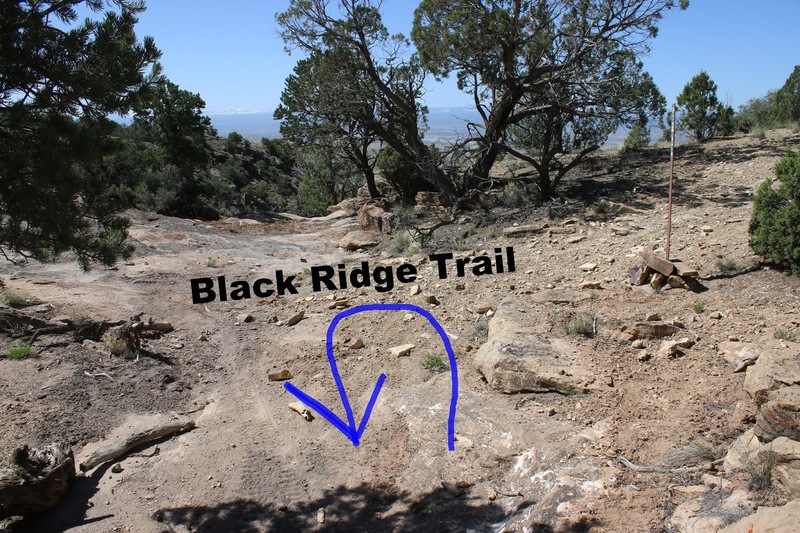 The wash route meets up with the Black Ridge trail near a spillover. If you go to the right you can climb for a little over a quarter mile up to the same spot on the ridge where we were earlier. 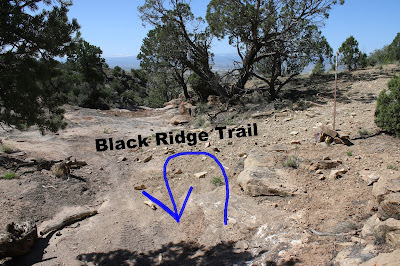 To the left the Black Ridge trail skirts along the rim and meets up with the Horse trail in about a half mile. As it turns out no matter which way you go to make a loop the round trip distance is about the same. Combining the wash route with the Horse trail comes out to about 1.25 miles while taking the steep route and combining that with the wash route is about 1.3 miles. 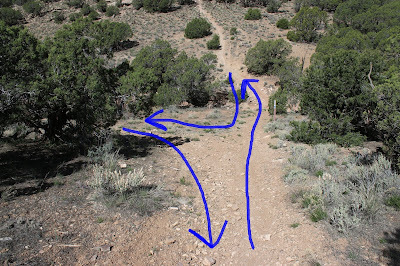 The longer loop would be to combine the steep route with the Horse trail for around 1.6 miles. 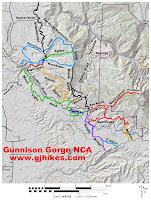 Anything that involves the steep route is going to be a harder workout of course whereas the wash route combined with the Horse trail is relatively easy. However you decide to slice and dice it the Black Ridge Connector has something to offer. If you would like to see it for yourself then all you have to do is 'Take a hike'.